September is a peak time for butterflies, especially after last winter, which seems to have decimated spring and summer butterfly numbers in our area. Butterflies are almost guaranteed to linger in your garden into autumn and even winter if their larval (caterpillar) food plants are available. Monarchs are one of the butterflies usually seen late in the year, appearing around September. Their larval food is milkweed. Monarchs seem to fly north before the emergence of butterfly weed, an orange milkweed found on dry, sunny roadsides. Dogbane, a very similar plant to milkweed, is reportedly another larval food for monarchs, though I haven’t seen caterpillars on dogbane myself. I often find caterpillars on common milkweed close to the end of the season. There is a species of milkweed for almost every habitat and even a climbing milkweed cousin found in bottomland forests. Black willows are also a larval food plant for viceroys, which mimic monarchs. 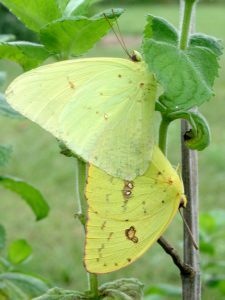 Unlike migrating monarchs, sulphur butterflies often stay in hospitable gardens. 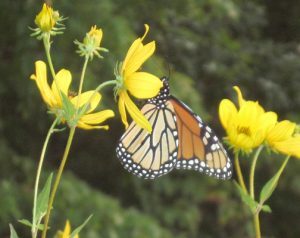 There are many species in this group of mostly yellow, medium-sized butterflies, and most eat legumes. Sicklepod and Senna obtusifolia (formerly Cassia) plants almost guarantee the presence of sleepy orange sulphurs. The plants are also a food source for cloudless sulphur caterpillars, as well as silver-spotted skippers and little yellows. Sicklepods are annual plants that grow two feet tall with pinnately compound leaves divided into six leaflets that fold together at night. Their small orange flowers produce long, narrow pods. Nectaries (flower glands that secrete nectar) on the leaf stems attract ants, presumably for protection. Sicklepods like disturbed soil in full sun, such as along power lines. Partridge pea (S. fasisculata) is a common roadside annual plant with yellow flowers. Cloudless sulphurs also eat S. hebecarpa, which is found in moist meadows. Sulphur butterflies are related to the whites, the most common being the cabbage white, introduced from Europe. If you offer these butterflies cabbages or nasturtiums, they could be around much of the year and are one of the first butterflies to enliven spring days in cities. One caveat is that they might compete with native whites. Black swallowtail caterpillars eat cool-season vegetables, especially parsley, dill, and fennel. Wild carrot or Queen Anne’s lace can also be used, but the butterflies much prefer other species. These swallowtails are not common and won’t stick around, but parsley will bring them in. 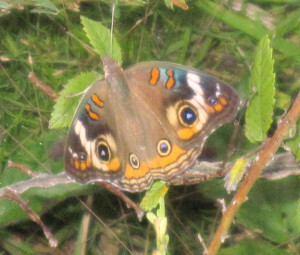 Buckeyes are summer butterflies often seen gliding low over lawns. They are medium-sized rich brown with large eyespots. Their spiny caterpillars eat plants like snapdragon, plantain, toadflax, and Ruellia. I always find them in late summer and fall on Gerardia, a small meadow plant with showy hot pink flowers and tiny green to purple leaves. It is partly parasitic on grass roots. Like some of the sulphurs, buckeyes colonize this area annually, but can’t survive winters inland. Tiger swallowtails, blues, and others will gather at puddles, wet gravel and pavement for the salts and water. A few species such as mourning cloaks hibernate as adults and need shelter. 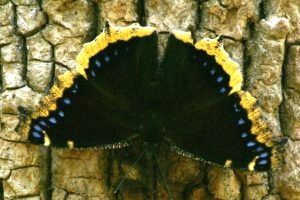 Mourning cloaks are a dramatic and relatively rare large butterfly to see in late winter. They live longer than monarchs—up to 11 months versus 8 months for southbound monarchs. Some of these migrate. 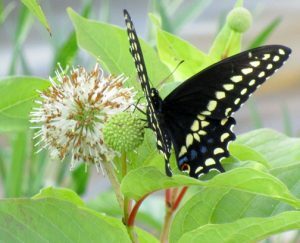 A yard can be rich in butterflies by combining larval food plants with nectar sources like dogbane, zinnias, bearsfoot, sumac, and buttonbush. Some butterflies sip at more unconventional foods, like over-ripe fruit. An American persimmon surrounded by fallen fruit attracts squadrons of red admirals, red-spotted purples, and question marks in early fall. A word of caution: yellow jackets and hornets also like this fruit. 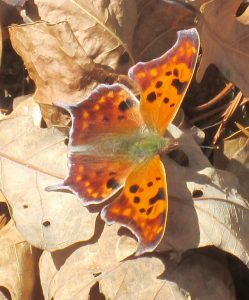 Several websites have photos and more information to help you identify butterflies in your garden, including nwf.org, butterfliesandmoths.org and butterfly-conservation.org. Michael Pollock is the founder of a conservation group, Northeast Creek Stream Watch (northeastcreek.org), and gardens in Durham.